Capable of taking high radial loads and axial loads in a single direction, taper roller bearings are also available in two and four row versions to support axial loads in either direction. Optimised designs can be supplied with high strength cages and, for arduous applications, in a range of advanced special materials. Due to increase of number and size of rollers, in HR – series, we were able to reach higher elevating capacity. Basically, they are set as double-type, the same, as single lined radial thrust bearings. In that case, necessary inside clearance is reached by selecting axis distance, between internal and external rings of two opposite bearings. Because, the both bearings are releasable, assembling of the internal rings with separators and external rings can be done independently. Due to size of the contact angle, tapered roller bearings are divided into three types: with normal, medium and high angle. There are double lined and four lined tapered roller bearings in the production at this moment. Basically, using separators from pressed steel. Conceiving high radial and axial load in one direction, tapered roller bearings, type NSK, are made in double lined and four lined models. This allows taking the axial load in both directions. Optimized constructions are different from each other because of the separators strength. For very difficult works there is selection of special modern materials. • Material Technology - Hardened high carbon chromium steel. 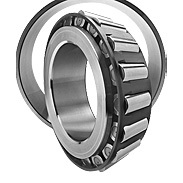 • NSK offers 2 and 4 row versions of our tapered roller bearings to support axial loads in either direction. • Advanced Materials - Patented materials including High TF and Super TF are available for more arduous conditions.